Pro faith. Pro family. Pro choice. Seeking reproductive health services has become a difficult, costly and confusing time. Because of the overwhelming restrictions in other states, many women now have no other option but to travel from their home and families to New Mexico to seek care and are often forced to exhaust their family’s financial resources. People of color, working families, youth, immigrants, and those who live in rural or reservation communities, look to the New Mexico Religious Coalition for Reproductive Choice as a place of safety for accessing reproductive health care. NM RCRC is unique in the reproductive health, rights and justice movements, because we draw upon the moral power of diverse religious communities to challenge the systems of oppression that make it difficult and sometimes impossible to obtain reproductive health care including abortion care. Our values require that we build a strong, visible and strategic network of people of faith and conscience committed to reproductive health, rights and justice in their congregations, communities and our local statehouse. Moving forward in 2018, we are prepared to will draw on the moral power of these diverse religious communities to challenge religious refusals and the use of religion to discriminate whether targeted at women, LGBTQ people, immigrants, or religious minorities. The narrow teachings of conservative religious organizations continue to dominate the public and political debates about reproductive and LGBTQ rights. While some religious doctrines explicitly oppose reproductive and LGBTQ rights, a growing number of people of faith and conscience, grounded in their understanding of the doctrines and teachings of their faith, have and continue to push for full support of reproductive and LGBTQ rights within their denominations and communities. We will be traveling more to the rural and remote areas of the state to meet and collaborate with local faith leaders, seek new signatures from clergy who represent denominations that already have resolutions supporting reproductive health and LGBTQ rights but haven’t yet signed our Public Letter of Support, continue leadership development with the Clergy Advisory Team, who lead Clinic Blessings, Pastoral Care In-services, work with faith leaders to co-create messaging, and serve as spokespersons in the media, with policymakers, and within their own congregations. We are committed to ensuring that all people, including those in our most remote communities, are guaranteed the right to express their sexuality with health and wholeness. We cannot do this without you. This year is going to be a decisive one, and we are so grateful for your support. NM RCRC was founded in 1978 by volunteers from several progressive Christian and Jewish denominations under the name New Mexico Religious Coalition for Abortion Rights, to counter the Catholic Church’s pledge to overturn the then recent Roe v Wade decision. Since that time, through 1999, we operated on a shoestring budget and extraordinary volunteer commitment. In 1999 we stepped out in faith and made the decision to change the organization from all volunteer to a staffed organization. Now, as we approach our 40th anniversary, our budget has grown 230% from 2007 – 2017, we will be adding additional space to our office and our staff has grown from a part-time Director to two full-time staff and a part-time consultant in 2018. Starting in 2001, when we assisted just eight women, we now assist more than 100 women per year. 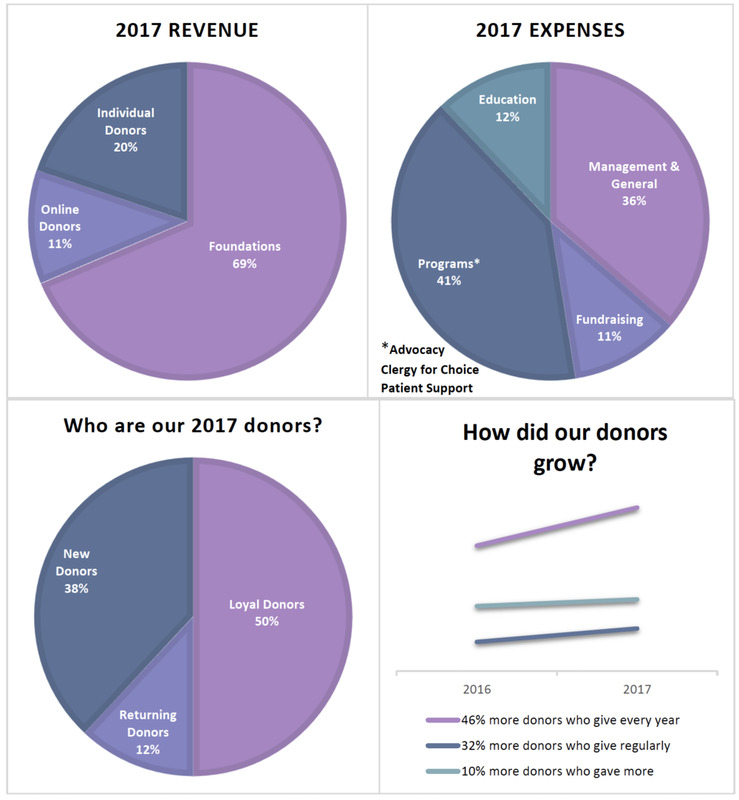 It is through our donors, volunteers and our partnership with the National Network of Abortion Funds, that we have directly assisted 108 women access their abortion in 2017 by providing transportation, lodging and meals. …but for only six weeks this year⏤that health plans were available and that many people would qualify for free or low-cost health insurance. Nationwide, nearly nine million people signed up for 2018 health insurance coverage through the healthcare.gov marketplace, we count that as an especially sweet victory from 2017! During the 2017 legislative session, over 70 members of clergy around the state joined with us to sign our public letter to stand in support of reproductive health, rights and justice and affirm a women’s moral authority to make decisions about her own body. With our partners in the Respect NM Women coalition, we introduced our own slate of bills to not only protect but expand access to reproductive healthcare in New Mexico. This included expanding coverage and access to contraception, protecting medical providers and patients from discriminatory religious refusals, and providing protections for pregnant workers. Along with other advocacy partner organizations, we defeated every piece of legislation that would impede individuals, especially those in marginalized communities, in accessing comprehensive reproductive health care in New Mexico. SB 121 – No Conversion Therapy, Sen. Jacob Candelaria and Rep. Andres Romero. NM RCRC supported our partner, Equality NM, and their efforts to ban “Gay Conversion” therapy. As people of faith and conscience, we are taught to love our family and our neighbors, and that includes accepting, embracing and treating them the way we want to be treated when they come out to us. We cannot lose one more person to the depression and suicide that this discredited and dangerous practice often causes. SB 121 was signed into law by the Governor on April 7, 2017. Get the latest updates on local, state, and national reproductive health issues, New Mexico policy, and opportunities to engage!